Located on the old Chiricahua road, Chandler's Milk Ranch was visited by raiding Apache's early October 1881. On the morning of October 25th, visitors included Ike and Billy Clanton, Frank and Tom McLaury as they had breakfast at this location. By 3:30 pm on the afternoon of October 26th, 1881, only Ike Clanton would still be alive, following what is now known as the gunfight near the O.K. Corral. As the only survivor of the group, Clanton would later recall..."we [Ike Clanton and Tom McLaury] had taken breakfast with Frank McLaury and William Clanton the day we came into town, [October 25th, 1881] at Jack Chandler's milk ranch, which is ten miles from here, at the foot of the Dragoon Mountains." 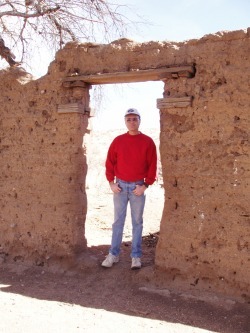 John Rose stands in the doorway of Chandler's milk ranch ruins. 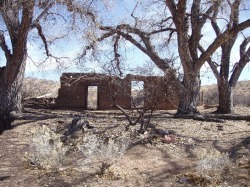 Back in 2006 and 2007 during Arizona's now defunct housing boom, homes in this condition or worse sold for top dollar.